For B&B accommodations while visiting Hershey or Gettysburg, PA, reserve the Blair Room at Carlisle House Bed and Breakfast. This lovely room boasts a queen-size bed and private bathroom with 5-foot multi-jetted shower. Rates for this room vary from $159 to $229 for double occupancy, according to the season. If you prefer not to book online, please call us at 717-249-0350 or email us at Info@TheCarlisleHouse.com. The first owner of the home in 1826, Andrew Blair, gives his name to this room on the 2nd floor at the rear. It has access both from the main house and directly from the parking area at the rear. A door also leads to the second-floor balcony where cafe tables and chairs allow you to relax outside. 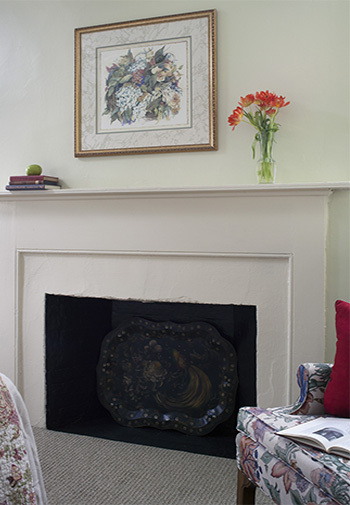 The room itself features an ornamental fireplace and a ceiling fan, and is conveniently located near the sitting room. The newly remodeled bathroom incorporates a five-foot wide shower with seat and a Grohe Aquatower with body-jets.